About Us| MJM Services Inc. 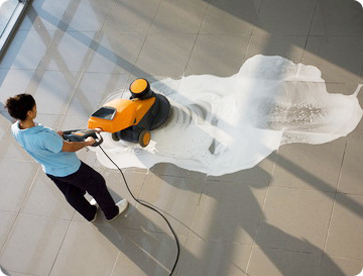 Combining award-winning technology with more than 25 years of consistent, innovative, facility service cleaning experience – MJM Janitorial Services is the leading choice of business in the janitorial industry. 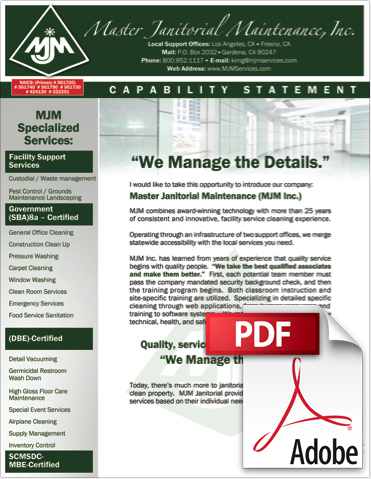 Operating through an infrastructure of two branch offices in California, and supportive contractors state wide, MJM Janitorial merges national accessibility with the regional and local services you need. MJM Janitorial’s management team learned early on that merely cleaning well did not guarantee accounts. We needed to provide services that customers valued and build loyalty in order to survive. Value-added services, reporting procedures, and clear communication helped us to determine what building managers wanted and needed. We understand that every building and business have their own unique way of running, and own characteristics. A complete working plan is created for each facility: specialized cleaning diagrams, daily schedules, and a complete quality assurance program. As well as recognizing the link between product quality and customer satisfaction, we also recognize that product quality is the result of process quality. As a result, there is a focus on continuous development of the company’s processes. This will lead to an improvement in process quality and product quality, and eventually an increase in customer satisfaction! This is our ultimate goal. We provide services and benefits that are unsurpassed in the industry today. CHP. Fleet Operations Section S.